I have read every book listed as well as nearly all of those mentioned in the commentaries – many more than once – each title I have read is printed in boldface to indicate this. Of course, I’ve read many science fiction novels in addition to those listed over the last 40 years. SF aficionados who have tolerantly read this far will have noticed that although I included Robert A. Heinlein and Isaac Asimov on this list, I did not include Arthur C. Clarke (1917-2008). These three writers were often referred to as the “Big Three” – the leading SF authors of their time. I am well aware of Clarke’s high position of honor among SF authors. Although I have read a number of his novels over the years, and enjoyed them, none of them really made as deep an impression on me as the books on my Top 21 list, nor did I ever feel the urge to go back and reread any of them. Another “classic” SF author who I’ve read is Edgar Rice Burroughs (1875-1950) from science fiction’s early days: I read a number of his Barsoom series of Mars books featuring John Carter when I was younger, but lost interest in them before getting through the entire series. Orson Scott Card’s Ender’s Game (1985) is a book that consistently makes it onto lists like this, and I’ve read it of course. The same goes for Neuromancer (1984) by William Gibson – a fun ride. I don’t really go in for cyberpunk much, although I did enjoy Gibson’s Pattern Recognition (2003) despite myself. If you like dystopias (currently quite the fad in young adult SF) don’t miss out on Anthony Burgess’s A Clockwork Orange (1962) – still freaky after all these years. Read these when you have a lot of time on your hands and are in the mood for immensely entertaining, sprawling space opera with zombies. Mary Doria Russell’s The Sparrow (1996) almost made it onto this list – don’t miss it, or its sequel Children of God (1998). A few other SF authors I’ve enjoyed who did not make it to this list include Douglas Adams, Poul Anderson, Greg Bear, Alfred Bester, Octavia E. Butler, and Robert Silverberg. I purposely didn’t include any information about which books or authors had won which awards (most of them, actually). One can find this information easily on the internet, if you’re interested. This list is full of Hugo, Nebula , and Locus Award winners – even two Nobel prize winners. I also left out information about radio, film, television, theatre, and opera adaptations of these books, although all of these media have developed treatments of these books (yes, even opera). In both cases (awards and media) I really wanted to just concentrate on the books themselves here. 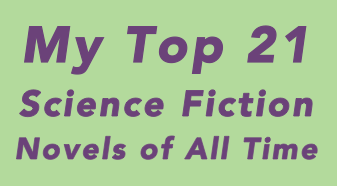 I chose 21 Top Science Fiction Novels because I liked the number – it is neither too many nor too few, and I like that it’s the product of two prime numbers that each have a traditionally mystical significance. Thanks for reading! And let me know if you (agree or) disagree, or think I’ve missed anything.